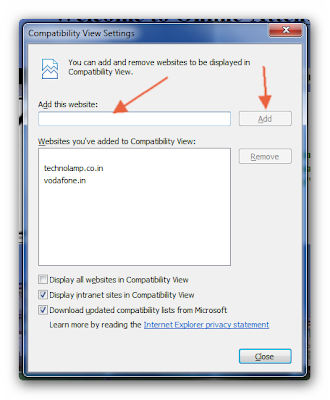 If you are using latest version of Internet Explorer and If you are unable open old version compatible websites or intranet sites, here is a solution to you to open all websites in your old Internet Explorer compatible mode. In clear we can open any website or intranet site in any latest IE. 1. Open the website that you want to visit, if it is old version compatible site then some of the features couldn't be loaded. 2. See at the right side of the URL bar. You will see a broken page symbol, that indicates the compatible mode. 3. Click on that broken page symbol and it would change the color to blue. You will get the old version compatible page and you can work as usual like in your old browser. 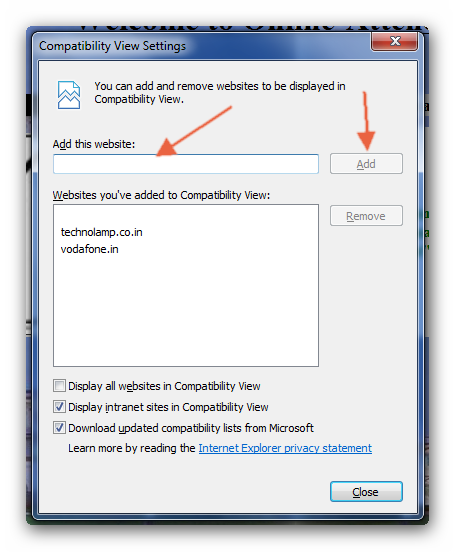 How to Change the Compatibility settings. 1. Press ALT key on the key board, it will open menu bar in Internet Explorer. 3. You can permanently add or remove any site from the list. You can open any website or intranet site by using this simple trick.